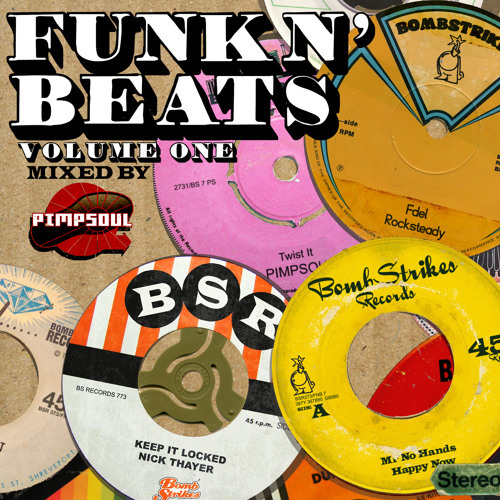 Funk N’ Beats Vol.1: Pimsoul 20 unmixed/Dj Friendly tracks and a Dj Mix With music from Breakestra, Dj Format, A.Skillz, Mooqee, Dr. Rubberfunk, Urban Soul, Fdel, Pimpsoul, Beatvandals, Skeewiff, Nick Thayer and more Buy Whole Compilation Here: Junodownload: http://bit.ly/1cnkx4C Beatport: http://btprt.dj/1elBuPs itunes: http://bit.ly/1hCvnv7 Enjoy this special minimix put together from the tracks on the compilation. The blurb: Following on from the massively successful 'Bass Funk' compilation, the much loved Bombstrikes, now entering its 10th year, pay homage to where it all started, taking it back to the ethos of what the label's sound is all about – The Funk and the Beats. As you would expect 'Funk N Beats' Vol. 1 is an immaculately curated compilation of not just Bombstrike's favourites but also some of their label contemporaries. With a selection of tracks that are undeniably game changers and stone cold classics as well as some brand new exclusives. Added to this, the continuous mix has been skillfully crafted together by one of the label's biggest artists, the funky maestro himself; Pimpsoul. The mix flows through both old and new seamlessly while still retaining the energy and the vibe that all these tracks have on their own. Another outstanding release from Bombstrikes showing that when it comes to all things beats, funk and party, they've got you covered. Once again a blasting EP !! !